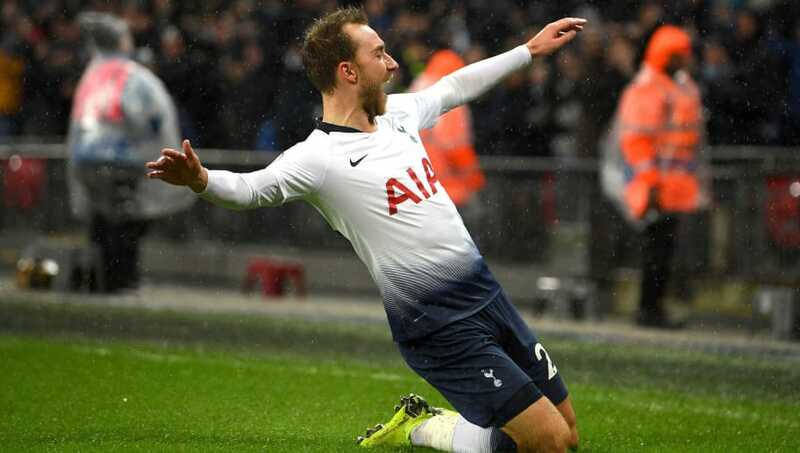 A late Christian Eriksen strike spared Tottenham's blushes as they edged to a narrow 1-0 win over Burnley at Wembley Stadium. The home side began dominant in possession, but it wasn't until the half hour mark when they had their first golden opportunity. Joe Hart kept his side on level terms with a fantastic save from Erik Lamela's close-range shot, meaning that both sides headed into half time with very little to shout about. Having been pinned down in their own half for the vast majority of the first half, ​Burnley began the second period well, getting forward and giving the ​Tottenham defence something to think about. The home side struggled to create any clear cut opportunities, with Hart once again denying Lamela with 20 minutes left with yet another fantastic save from close range. It looked as though Tottenham would be left frustrated, but ​Eriksen spared their blushes in injury time. Harry Kane laid the ball off for the Danish international, who neatly tucked the ball past Hart at his near post in the 91st minute to win all three points for the home side. After their heroics in Barcelona on Tuesday night in the Champions League, it seemed as though Tottenham just took their foot off the gas. They enjoyed the vast majority of the possession, but they managed just one shot on target in the first half and failed to create many clear cut chances throughout the game. They were lucky that Burnley failed to ever get out of their own half and didn't pose much of a threat going forward, otherwise they could easily have found themselves behind. Instead, they left it very late to find their breakthrough. There was a huge feeling of relief around Wembley after Eriksen's goal and they'll certainly be delighted with the win, but there will be a number of questions for Tottenham to answer after what was a far from convincing performance. Starting XI: Lloris (6); Trippier (7), Alderweireld (7), Davies (7), Rose (6); Skipp (7), Sissoko (7); Lucas (6), Alli (6), Lamela (8*); Kane (7). Substitutes: Eriksen (8), Son (6), Llorente (6). STAR MAN - On a day where there weren't many chances to shout about, Erik Lamela looked the most threatening player on the pitch throughout the game. He'll feel hard done after failing to get himself on the scoresheet after having two brilliant opportunities to score, when on another day they may well have found the back of the net. Hart was able to deny him on both occasions, however take nothing away from Lamela's performance on a day where most of Tottenham's other players failed to turn up. WORST PLAYER - It was a bad day at the office for Danny Rose. He would've been relishing the chance to get forward and contribute prior to kick off, but he never posed a clear threat down the left hand side with a number of wayward crosses. He wasn't really tested on the defensive side with Burnley struggling to get out of their own half, and unfortunately fans didn't see much productivity from the Englishman in the attacking half either. An afternoon to forget for the left-back. Having put in a very good defensive display for 90 minutes, the Burnley players were left heartbroken after Eriksen's injury-time winner. The Clarets' struggles going forward continued today and it's an issue which will likely need addressing very soon, but it was the defensive line who stepped up on the day. They kept a Tottenham side full of confidence at bay, limiting them to just one shot on target in the first half as they made the home side work for their goal. Unfortunately they couldn't keep them out, although there will be plenty of positives for Sean Dyche and his men to take away from the game. They remain just two points above the relegation zone and missed the chance to give themselves some breathing space above the ​Premier League's bottom three, however if they can replicate defensive performances like their on the day then they will prove to be a very tough team to get a result out of. Starting XI: Hart (8*); Bardsley (7), Long (7), Tarkowski (7), Mee (7), Taylor (6); Lennon (6), Westwood (7), Cork (5), Brady (6); Barnes (6). Substitutes: Wood (7), Vokes (N/A), Hendrick (N/A). STAR MAN - It was a solid defensive performance from the visitors, and Joe Hart was a central figure in that. There were just three shots on target in the whole game for Spurs, and Hart had to be very alert to keep two of those efforts out, producing two outstanding saves to keep his side in the game. Really good save from Joe Hart. Strong right hand. Unfortunately he couldn't keep a clean sheet as Eriksen found a way through the Englishman at his near post, but that doesn't take away from the fact that Hart can hold his head up high after an outstanding performance between the sticks. Without him, it would've been a lost worse than a 1-0 defeat for Burnley. WORST PLAYER - Burnley never created any clear cut opportunities and struggled to get out of their own half throughout the game, with Aaron Lennon having a particularly quiet game. He didn't provide much of a threat out wide and never looked comfortable. He will need to improve his performances if Burnley are to start clawing themselves away from a relegation battle, with performances like his today not helping matters at all. The win means Tottenham continue to pile the pressure on the top two, and has given them even more momentum heading into their Carabao Cup quarter-final clash against rivals Arsenal on Wednesday night.